If you’re a newcomer to the keto pancake game, then I’d like to offer you a warm welcome. Your likely to stumble upon all types of low carb pancakes that are a mixture of cream cheese and eggs. Those are good, but we don’t settle for good around here. That’s why we took a classic low carb protein pancake recipe I’ve been making for years and pumped up the fat content to achieve the perfect keto pancake recipe. Is there a more perfect food in this world than pancakes? They’re cheap, simple, tasty, fun to make. Just about everything you could ask for in a food. Now what if I just completely blew your mind and told you we’ve created a variation of this perfect food that is still simple, tasty, and fun, but now it has the Perfect Keto Macros as well?!?! You’re not dreaming, you’re not in heaven, you’re not a 5 year old walking through the front gate at disney world for the first time, you’re someplace better! You’re about to unlock the recipe for Keto Macro Cakes! From concept to finished product this recipe took us about 2 weeks. We’re fast approaching holiday season, and that means we spend every waking hour perfecting Thanksgiving recipes. Thanksgiving is the busiest time of the year for food bloggers, and we’re putting in a lot of work at the moment. However, sometimes an idea will strike you, and nothing else seems to matter. That idea was these keto pancakes! When the idea struck I immediately halted what I was doing and turned to Megha, made eye contact and slowly said 3 deliberate words. “Keto Macro Cakes.” She stared back at me and said “Pistachio. Orange. Beyonce.” The cheeky bugger(no I’m not from England, but I like their lingo! ), she was mocking me! She didn’t understand the magnitude of this revelation. For the next few days we continued on with our planned thanksgiving dishes. Pecan pie here, green bean casserole there, but deep inside me I had a burning desire to begin working on my passion project. Keto pancakes! Finally we had a slight down moment in the thanksgiving hustle and bustle and I was able to execute this recipe. I had all the schematics drawn up like anyone who has been obsessing over a low carb breakfast dish for 10 days would. I had all the macros calculated, the ingredients listed, it was going to be perfect. These light brown bundles of joy would deliver a taste any pancake lover would approve of, and a macro profile to appease even the most ardent of keto police(people on the internet that point out things that aren’t keto in a condescending manner). Spoiler alert. The results exceeded my wildest expectations! We built off of the classic low carb cream cheese pancake base. This batter has a thin consistency comparable to a crepe batter. When it cooks it will gain a bit of volume and will not be crepe like in the final dimensions. It will be a thin pancake. The keto macro cakes are easy to flip as long as you wait for the bubbles to rise to the surface. This means they are ready to flip. Another note is that you will not need to grease your surface as much as you would for normal pancakes. I like to spray some coconut oil down for the first few, but after that I just start pouring the batter on without spray. They don’t stick due to the high fat content. This recipe is sized to make 20 pancakes. At 20 pancakes per batch you’re looking at 100 calories per pancake. When you just have a big bowl of batter it can be hard to conceptualize what batter amount equates to 1/20th though right? Well I have a bit of an inexact pancake size hack you can use(Warning: fractions on fractions). Take a 1/4c measuring cup and fill it 70%-80% of the way to the top. Using that measuring technique for each pancake you will come out with 20 pancakes, 100 calories each. This recipe can easily be scaled down to 1/4th if you’re just cooking for 1. These keto macro cakes are not only perfect served hot with some butter and sugar free maple syrup, but they are great for storing and snacking on throughout the week. In fact, I took these to work with me for lunch the following couple days, as well as snacked on them straight out of the fridge. It’s nice to have a snack at the ready that has perfect keto macros. The protein powder you use will be the only real variable in this recipe. I can’t recommend IsoPure Zero Carb protein powder enough. It tastes absolutely amazing and just as the name suggests, has 0 carbs. I’d suggest you go for the cookies and cream variety, but I’m sure they’re all good. If you want to use unflavored protein you can definitely up your flavor game with some vanilla or cinnamon. These do taste delicious even with unflavored whey. 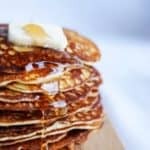 These are my favorite keto pancakes on our website. If you’re already made them 10 times and are getting sick of them(but let’s be honest, no one gets sick of pancakes) then try our coconut pancakes or our dutch baby pancake recipes! Recipe video at the top of this post! In a food processor or large mixing bowl combine cream cheese, butter and eggs. It is easiest to use room temperature butter and cream cheese. Add the protein powder to the wet ingredient mixture and mix until fully combined. Add the vanilla extract and mix again. Heat a skillet on medium heat. Pour in the pancake batter and cook for 2 minutes on each side. See "notes on serving size" section for info on how much batter to use for 100 calorie cakes.